Whoa! I’m enraptured! Found this magnificent beauty in our garden a few days ago! 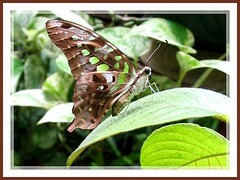 A large tropical butterfly with a wingspan of 7-8 cm. What a spectacular looking butterfly! Apple green spots and bands of variable sizes beautifully contrast against its predominantly black upperside and fashioned in fabulous symmetry! Typical of the Swallowtail butterflies, its hindwings end with a short tail which is longer in the female species. Absolutely gorgeous! Its underside is also as attractive with similar green spots on sooty-brown ground color that is mottled with darker brown, grey and pink streaks, though markings are not as clearly defined. Very colorful indeed as these colors tint onto its thorax and abdomen too. The last time I saw this elusive beauty was almost 6 months ago whereby for almost a week to 10 days it visited our backyard religiously around 1pm, flying swiftly and restlessly around and flitting about the Annona squamosa tree, barely stopping for a second or two. Just knew today that this tree is one of its larval host plants…no wonder, it kept coming back! Anyway I ran out of patience chasing it around with my camera and just gave up monitoring its visits then. 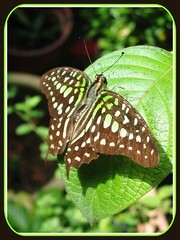 Common name: Tailed Jay, Tailed Green Jay, Green Spotted Triangle, Green Triangle, Green Triangle Kite. Range: Native to India, Sri Lanka through Southeast Asia and into Australia. Widely distributed across Asia – India, Nepal, Sri Lanka, Andamans, Bangladesh, Brunei, Myanmar, Thailand, Laos, Kampuchea, southern China (including Hainan), Taiwan, South East Asia to Papua New Guinea and Australia (northern Queensland). Habitat: Diverse habitats. Tropical rain forests or wooded regions of low elevations. Cultivated urban areas that include gardens and parks, as well as fruit orchards of the Annona species which are its host plants. Food plants: The larval food plants are Polyalthia longifolia and mostly plants in the Annonacea family, especially Annona squamosa, Annona reticulata and Annona glabra. The adults on the other hand, can be found nectaring on a variety of flowers, such as Lantana, Ixora and Mussaenda. 1. Wikipedia for the lifecycle of Graphium agamemnon, and much much more. Wow, amazing photos. I always found this butterfly so restless. Never let me take a shot! 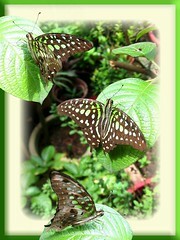 Very delightful pictures:) Guess you might have pictures of black winged, green spotted butterflies. It would be nice if you can share them. Thank you, Sibyl! So far, this is the only one of the color range you mentioned that frequents our garden.